Domtar recently held events at many of its sites in celebration of Manufacturing Day — an annual, multi-industry celebration of modern manufacturing meant to inspire the next generation of manufacturers. During the day, organizers invite companies to host events to showcase what it’s like to work in manufacturing and to dispel common misconceptions about the industry. Several Domtar facilities hosted Manufacturing Day events, conducted tours and attended local job fairs to share with the next generation of manufacturers what Domtar is and what makes Domtar a great place to work. The Addison Converting Center participated in the College of DuPage’s annual Manufacturing and Engineering Technology Career Expo, hosting 27 students from Addison Trail High School. During the event, the students received a tour of the mill and participated in Q&A sessions that gave an overview of the company and explained the types of machinery we use. The sessions also covered career paths and skill requirements. The goal of the event was to steer students toward post-secondary training and education that will prepare them for manufacturing occupations. In honor of Manufacturing Day, the Ashdown Mill participated in the annual job fair at Cossatot Community College of the University of Arkansas. During the fair, representatives from the mill met with students to introduce them to Domtar and the employment opportunities it offers. For the third year in a row, the Delaware Personal Care facility celebrated Manufacturing Day by inviting groups of students from local schools to learn more about the facility. This year, 60 disadvantaged youth from three public middle schools received personal protective equipment training, a tour of the facility, an overview presentation and customized Domtar water bottles. The Johnsonburg Mill hosted its third annual Tour of Careers for the junior class of Johnsonburg Area High School. General manager Grant Forrest welcomed the group of 32 students and their chaperones and gave them a brief overview of the mill’s history, community impact, safety and environmental policies, current operation status, and employment statistics. The students visited eight different career areas in the mill, where they listened to employees describe their educational backgrounds and career paths. The Owensboro Converting Center hosted a group of Owensboro High School students for Manufacturing Day. Plant manager Mike Arblaster and production manager Chris Buskill greeted the group and discussed the importance of working safely and building a good work ethic. After the students watched the plant safety video and received personal protective equipment training, they toured the site. After the tour, students had an opportunity to ask questions and were given a ream of paper and a goodie bag. The Rothschild Mill hosted the first business discussion and tour for Wisconsin’s Freight Advisory Committee. The committee will soon finalize its five-year transportation plan, which addresses rail, truck and waterway transportation. It contacted Domtar to better align transportation needs and to learn more about Wisconsin’s business and industry. 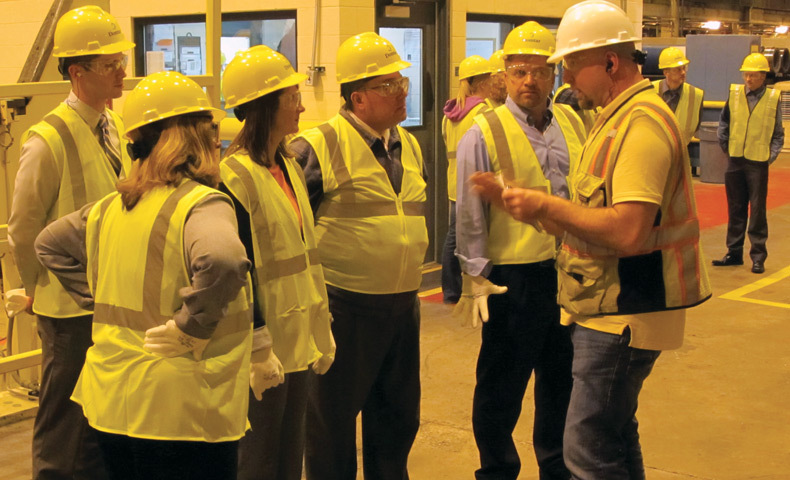 The mill opened its doors to 40 members of the committee to showcase Domtar as a company, as well as our products, our community impact and our position on issues related to state transportation. For the third straight year, the Waco Personal Care facility participated in Manufacturing Day by hosting a booth at a STEAM fair in the Waco area. STEAM is an educational approach to learning that uses science, technology, engineering, the arts and math as access points for guiding students’ curiosity and critical thinking skills. The Waco facility was one of 80 exhibitors that taught students about the manufacturing environment and local employment opportunities. The Washington Court House converting and distributing facility participated in the Fayette County Manufacturing Day event, where many local manufacturing employers provided students with tours and brief overviews of their facilities. Students had an opportunity to visit the Domtar site, where they toured showcased production processes and were provided overviews of various positions and skill requirements. Domtar is continually innovating in the paper fiber industry to better serve our customers, improve our products, become more efficient and reduce our environmental footprint. But at our core, we are manufacturers. We create quality, sustainable products that people rely on every day. In the process, we provide thousands of jobs across North America and contribute billions of dollars to local and regional economies. Manufacturing Day is a rallying point that empowers manufacturers to celebrate their successes and inspire young people to join the manufacturing industry, help their local economies and communities thrive, and truly create something special. You can learn more about Manufacturing Day on the organization’s website. Photo taken at the Rothschild Mill in Rothschild, Kentucky.